The VDP (Verband Deutscher Prädikatsweingüter) is a group of 200 wine estates from all 13 regions, comprising producers of many of Germany’s best wines. There are a handful of top estates however such as Martin Tesch, J.B.Becker or Teresa Breuer that are not within the VDP fold either for reasons of their own or because they’ve fallen foul of the club in one way or another. Between them, the VDP’s estates account for roughly five per cent (4,900 ha) of the country’s vineyard area and 12 per cent of Germany’s Riesling. The term Grosses Gewächs itself can be a little confusing but in essence it means dry wines only from top sites and only those estates within the VDP are entitled to the prized GG initials. It is separate from the VDP’s pyramid of quality, which, in ascending order, are: Gutswein (entry level), Ortswein (village), Erste Lage (first class) and Grosse Lage (the best vineyards). These four levels are on a par with Burgundy’s Bourgogne, Village, Premier Cru and Grand Cru levels. So far so good, but there are anomalous flies in the ointment, one being the now discredited Grosslage (as distinct from Grosse Lage) which means simply an undifferentiated wine area. Riesling is the mainstay of the VDP’s wines and consequently the dominant feature of the tasting. Climate change has been kind not just to Riesling however but perhaps even more so to Germany’s reds, most notably Spätburgunder, or Pinot Noir. A growing appreciation of German Spätburgunder has meant that there is now a substantial critical mass of high quality Pinot and the interest in these reds from critics and consumers alike has kept pace with this growth. Other varieties coming to the party, notably Weissburgunder, Chardonnay, Silvaner, Grauburgunder and Lemberger, show that Germany is anything but a one trick Riesling pony. 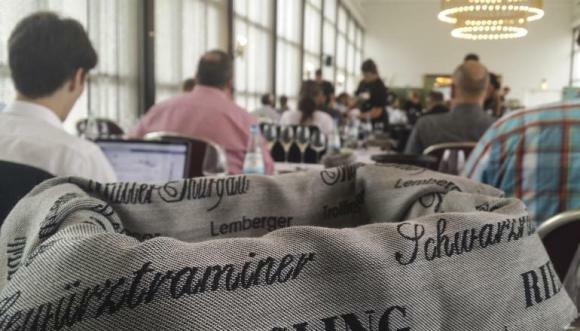 Held over two days and conducted at as leisurely a pace as the critic wishes, the tasting offers an unrivalled opportunity to look at three main features of German wine. Firstly, there’s a chance to assess the new vintage itself, or, in the case of red wines, the previous vintage. Secondly, the tasting offers an unrivalled glimpse of the ups and downs and the relative quality and styles coming out of each estate. Finally, and more nebulously, there’s opportunity to assess differences in regional styles. As an illustration of the latter for instance, the Mosel is the heartland of Germany’s delicate sweet whites made from Riesling, so it would not necessarily be expected to keep pace in its dry wine styles with the major dry Riesling strongholds of the Pfalz, Rheinhessen, Nahe or Rheingau. Nonetheless, even if sweet Riesling specialists Joh Jos Prüm or Egon Müller are irrelevant to the tasting, there are great Mosel dry Riesling producers such as Heymann Löwenstein, Markus Molitor and Ernst Loosen. By the same token, if Germany’s reputation for Spätburgunder once stemmed from the Ahr and Baden, clearly there are great a number of superb Pinot producers emerging from Sudpfalz, Rheinhessen, Rheingau and Franken too. Vintage always produces kaleidoscopic effects in Germany given the different latitudes and altitudes of each of its many regions and the varied styles that are strongest within each region. 2013 had been generally difficult and 2014, while also challenging, was earlier and generally kinder to Germany’s vintners. In general, the quality of the dry Rieslings was impressive. The best are beautiful, ripe, rich food-friendly wines of balance and freshness that can be drunk soon but that will cellar well and grow in stature and flavour complexity over the next three to five years, or longer. There is an astonishing depth of talent in these estates not just because they have been producing their wines from tried and tested terroirs for aeons, but because family traditions and ties are strong. While it’s a natural instinct for children to rebel against the practices and the habits of their parents, the most sensitive of the new generation of Winzer are well aware of the great terroirs that they have inherited or been entrusted with. Bringing their samples of Kalkstein (limestone) or Blauschiefer (blue slate) along to fairs such as Prowein is no empty gesture but shows just how deeply they believe, literally, in the importance of their roots. I regret that Germany’s dry Rieslings, and to an extent the other styles I’ve mentioned, are not better known or appreciated in the UK. Hopefully there’s a ‘yet’ there. Those in the know are well aware that the old prejudices no longer hold water and that quality has improved vastly across the board. Luckily we do have good specialist importers and retailers such as The Wine Barn, Howard Ripley, Awin Barratt Siegel, The Winery and others committed to the German wine cause. I hope they survive and prosper because we’re still only at the foothills of true German wine appreciation.